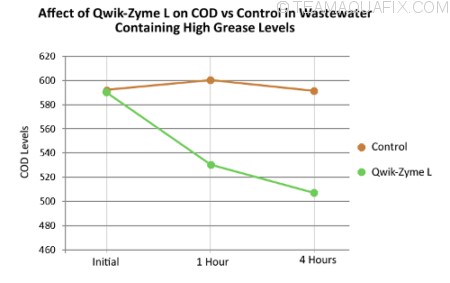 Qwik-Zyme L is an excellent product for grease control in sequencing batch reactors (SBR), wastewater treatment plants, equalization tanks, and food and egg processing plants. It is the top-of-the-line lift station grease degrader. This is not a bacterial product, but rather a high tech saliva. 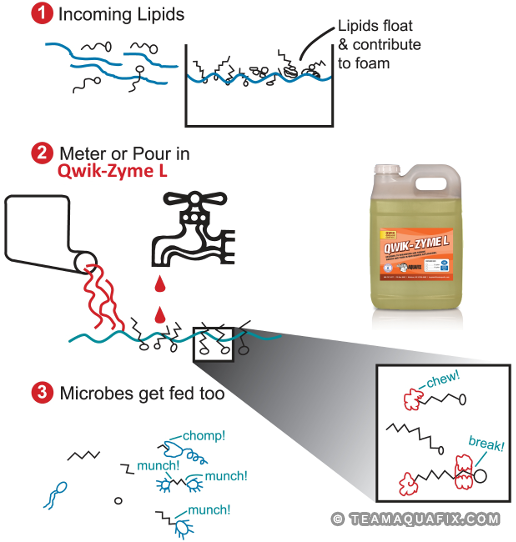 This means that Qwik-Zyme L incorporates three types of lipid degrading biocatalysts to provide dramatic hydrolysis of fat, oil, grease (FOG) and resulting fatty acids. Qwik-Zyme L will degrade the FOG, and your bacteria will eat it. Qwik-Zyme L can degrade a range of fatty acids such as oleic, steric, palmitic as well as fish oils, triglycerides, milk, and animal fats. No more grease, no more foam, and no more backups. *55 gallons available at $29.54 per gallon, please call to order 888-757-9577. Why is it so important to control fats, oils and grease? Qwik-Zyme L was tested against a control for a customer with COD issues. This testing showed a sharp decrease in COD when using Qwik-Zyme L, while the control was essentially at the same level after 4 hours. The control did see an initial increase in COD due to COD chains separating but not degrading and giving the appearance of more COD. In the winter months, when water temperatures are colder, the naturally occurring bacteria cannot completely break down FOG and the fatty acids that build up in the wastewater plant. These fatty acids are then taken up by filaments like Microthrix Parvicella and Nocardia which allows them to float and foam. Qwik-Zyme L breaks up these fatty acids and cuts off the filament’s food source. It’s fascinating science for wastewater operators. 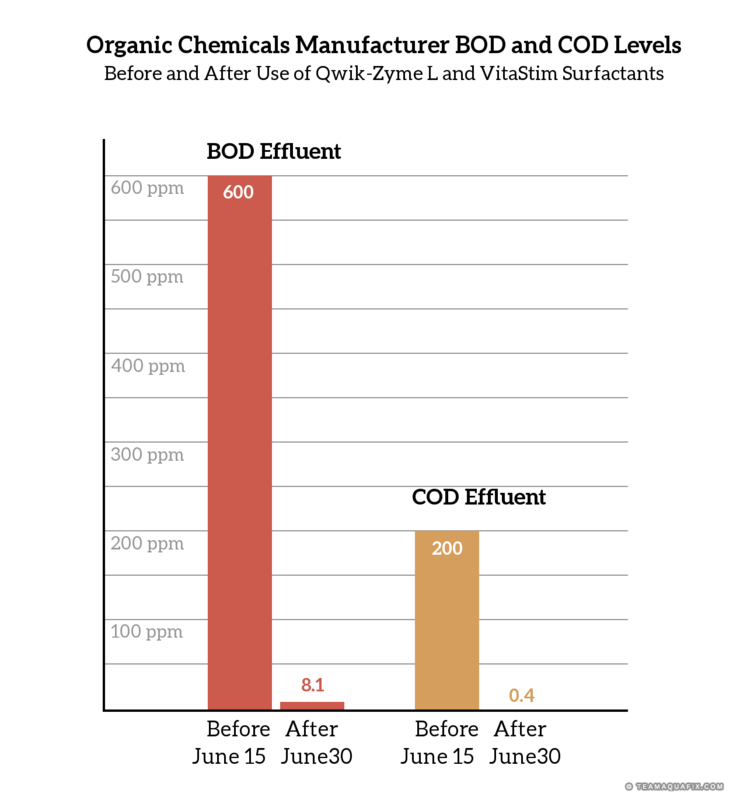 Qwik-Zyme L – Grease Degrader works well with VitaStim Low F:M and Foam Buster and is used in all types of municipal and industrial applications. 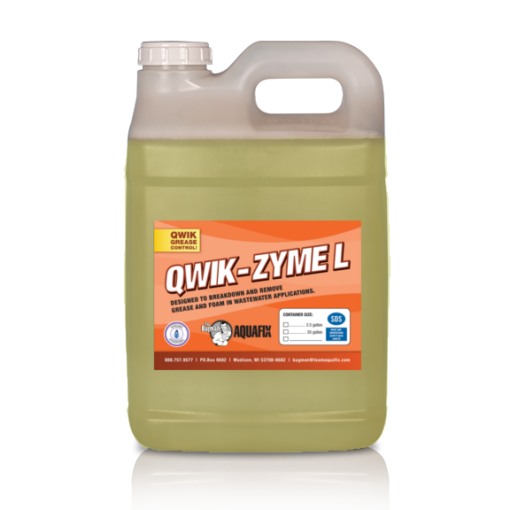 For especially tough issues, use the synergistic combination of Qwik-Zyme L and Foam Buster. Foam Buster alters the bacteria populations so the foam will not return while Qwik-Zyme L helps to get the grease under control. 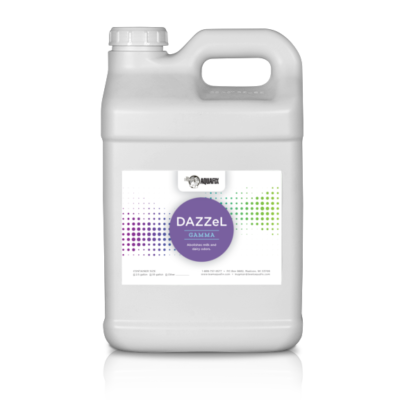 This product is either metered or poured into the front end of the wastewater process. Do not spray this product into the air. 2.) Add Qwik-Zyme L to the head of the plant (Double dosage if possible). This will heavily break down FOG for the bacteria to easily digest. 3.) Add Foam Buster to the head of the plant or aeration basin (Double dosage if possible). This will activate and stimulate the bacteria to specifically break down FOG that is feeding the Nocardia. An organic chemical manufacturer in North Carolina contacted us about foam being generated in their treatment system. They use a series of two lagoons, with high aeration in the first lagoon to pretreat their waste stream before sending it to the municipal wastewater treatment plant. The waste stream has high concentrations of lauric and stearic acids which contribute to influent BOD 600 ppm, and COD 200 ppm. The system was not achieving complete breakdown of these fatty acids as the waste stream moved quickly through the system. The operator began using VitaStim Surfactants to add new bacteria cultures which break-down of fatty acids. This improvement was enough to make the customer happy, but we thought that adding our Qwik-Zyme L, liquid biocatalyst product, would help break down the fatty acids even more quickly. The biocatalyst accelerated the process, a huge benefit in this waste stream with a short detention time. The combination of biocatalyst and bacteria brought the systems effluent waste stream down to BOD 8.1 ppm, and COD .4 ppm. The municipality upgraded their wastewater plant three years ago with fine bubble aeration. Immediately they began noticing a foot of foam on the basins and persistently higher effluent ammonia numbers. They traced the foaming issue down to a tannery in town. The tannery has an existing wastewater process of their own consisting of an equalization tank followed by aeration and a very simple DAF unit. To clean the fat, oil and grease off hides the tannery uses surfactants, substances similar to soap in their make-up. We learned the cause of the issue in the municipal plant was that surfactants were passing through the tannery system undigested, and then foaming when they hit the fine bubble diffusers at the municipal system. The tannery experimented with a number of surfactants to help stop the foaming, but to no avail. The solution was to breakdown the surfactants at the tannery’s treatment plant. We had them increase the holding time in their EQ tank to create anoxic conditions and then they added Qwik-Zyme L and Qwik-Zyme P to speed the breakdown the grease and long chain fatty acids. The process was further enhanced by adding Foam Buster to the aeration tank. 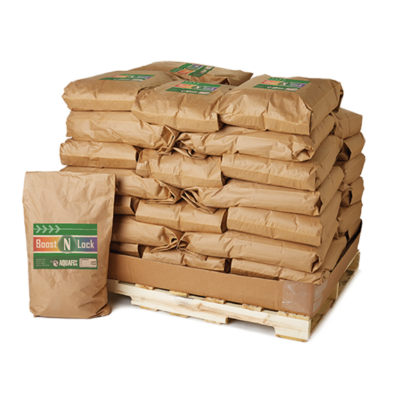 Foam Buster’s micronutrient blend boosts the ability of native bacteria to degrade fatty acids and grease. The biocatalysts kicked off the surfactant degradation process, and native bacteria with the help of Foam Buster finished the process. Immediately, the city noticed 95% less foam and better settling. As the foam went away they also realized that the surfactants had been knocking out their nitrifiers. As the surfactants were no longer hitting them as they had before, nitrification improved and their effluent ammonia dropped. Now both the municipality and tannery are happy. A customer in central Alabama has a SBR system that was having an ongoing issue with Microthrix Parvicella. It was causing bad foaming, poor settling, and a cloudy effluent. This plant was out of compliance and needed immediate help. Their flow rate was 100,000 GPD. They added 10 lbs. of Foam Buster and 1 quart of Qwik-Zyme L per day for 7 days. 7 days later: Grease was cut in half and settling had improved. 21 days later: The foam was gone and the plant was in compliance with the super tight limits. To achieve their effluent goals, this processor has to incorporate 2 pretreatment steps before the waste stream gets to their aeration basin. First a trickling filter takes the BOD from around 4000 ppm to 1000 ppm. Next a Dissolved Air Floatation (DAF) unit removes all the grease that the trickling filter didn’t remove. Trickling filters are notorious for allowing grease to pass right through them. They system generally worked pretty well, but was dependent on the DAF making up for the shortcomings of the trickling filter. However, one day a mechanical issue resulted in the DAF being taken offline, and the timeline for getting the replacement part was unknown. With only the trickling filter for pretreatment, and no other way to remove the fats, oils, and grease (FOG) they soon began foaming. This customer started with our fatty acids analysis to determine what the concentrations of FOG were, and which fatty acids it consisted of. 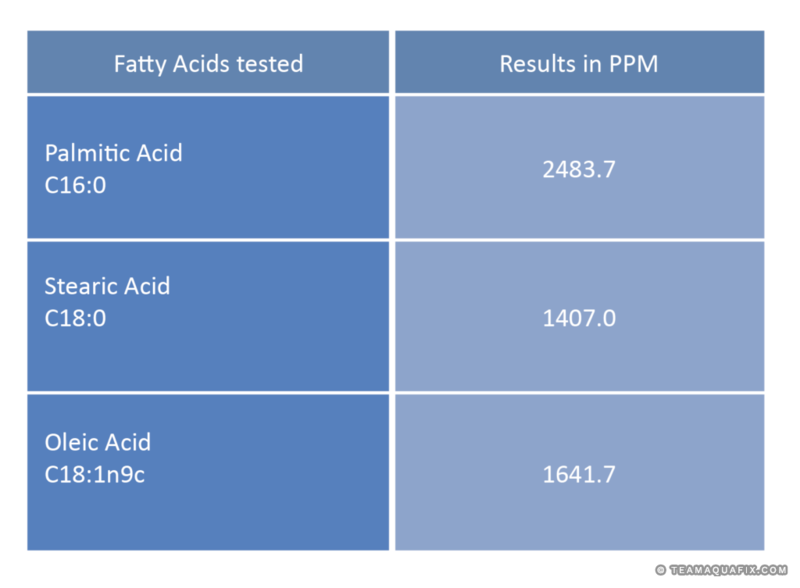 Fatty Acid Testing revealed especially high amounts of Palmitic, Stearic, and Oleic acid. Also typically the highest concentration Fatty Acids in municipal influent. Since the loss of the DAF, total fatty acids in aeration had now jumped up to 7551.5 ppm. The fastest way to reduce the foam was to accelerate the degradation of the very high FOG in the basin. The most prevalent long chain fatty acids are also typically slow to degrade molecules in an aerobic system. The operator used Qwik-Zyme L at a rate of 2 quarts per day, combined with our VitaStim bacteria blend. The biocatalysts in Qwik-Zyme L act on specific structures in the FOG, which allows bacteria in the system to quickly degrade the FOG molecule. Within 30 days the foam had disappeared, despite the DAF unit still not being brought back online. We had a bad Nocardia break out in our SBR and it was hard to control. We heard about the Qwik-Zyme L biocatalyst, and it worked. It was like Wow the foam went right down. Potent stuff. The cheese plant really dumped on us and the plant foamed up. We used a bit of Qwik-Zyme L and it ate it up. Incredible.